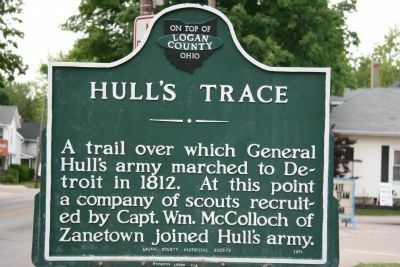 A trail over which General Hull's army marched to Detroit in 1812. At this point a company of scouts recruited by Capt. Wm. McColloch of Zanetown joined Hull's army. Location. 40° 15.221′ N, 83° 45.352′ W. Marker is in West Liberty, Ohio, in Logan County. Marker is at the intersection of North Detroit Street (U.S. 68) and Columbus Street, on the right when traveling north on North Detroit Street. Touch for map. When traveling through West Liberty, Ohio on US 68 (Detroit Street)one will find that this historical marker is located on the Detroit Street side of the West Liberty town hall building. Marker is in this post office area: West Liberty OH 43357, United States of America. Touch for directions. View of historical marker in foreground with view of US 68 (follows Hull's Trace) looking north. More about this marker. 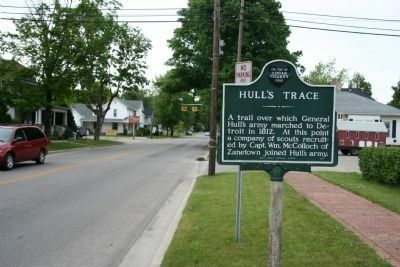 This historical marker is part of a series of markers that tracks the War of 1812 march of General Hull's army from Urbana, Ohio to Detroit, Michigan. There are two DAR markers between Moluntha Town and the Manary Blockhouse. They are bronze plaques on boulders. The first is at the old Bellefontaine Country Club, now called Liberty Hills Golf Course. The second is at Logan Acres (the Logan County Home), it has been moved when the new facility was built. Also, at the Logan Acres site is the grave of Col. McPherson. Another marker, "Bokengehalis town" was nearby, but has been damaged. A third boulder was at the old Logan County Children's Home, but it has been lost. — Submitted June 20, 2012, by Rev. Ronald Irick of West Liberty, Ohio. More. Search the internet for Hull's Trace. Credits. This page was last revised on June 16, 2016. This page originally submitted on June 9, 2009, by Dale K. Benington of Toledo, Ohio. This page has been viewed 2,077 times since then and 14 times this year. Photos: 1, 2. submitted on June 9, 2009, by Dale K. Benington of Toledo, Ohio. • Craig Swain was the editor who published this page.